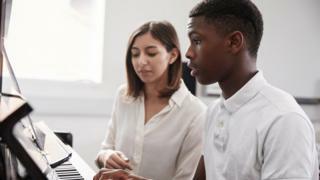 Music lessons in England schools could be under threat unless central government covers the cost of a pay rise for teachers, councils claim. In July, the government agreed to fund a 3.5% rise for lower-paid teachers and 1.5% and 2% for higher-paid teachers, senior staff and head teachers. But councils say this does not cover centrally employed teachers, most of whom offer music lessons in schools. The government says it is putting £400m into arts and music over four years. 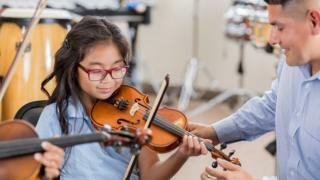 The Local Government Association (LGA) is concerned that young people will miss out on music lessons if councils have to cut back. It says the extra cost of a 1 to 2.5% pay rise for centrally employed teachers will be around £5.5m – a cost that councils have not budgeted for. With councils facing a challenging financial landscape, the LGA is warning that many will have little choice but to cut back on services like music tuition. Is it just music teachers? No. While the majority of these posts are within music teaching, other roles centre around additional support for specific groups. those supporting schools with early years provision. There are currently around 4,900 centrally employed teachers in England. What does the LGA say? The LGA fears certain types of education provision will be cut. Cllr Anntoinette Bramble, chair of the LGA’s children and young people board, says: “While we were pleased that the government announced that it would fully fund a pay increase for teachers in the summer, it needs to extend this to fund the pay rise for centrally employed teachers, such as those providing music tuition. “Local government is already under massive financial pressure with many services over-stretched. What do school leaders say? Paul Whiteman, general secretary of school leaders’ union NAHT, says schools are already facing pressures on their budgets. “Local authorities have also suffered ruinous funding cuts over the last 10 years, and cannot now be expected to find the money for millions of centrally employed teachers’ pay rises with no additional money from the government at all.